Mississippi Gov. 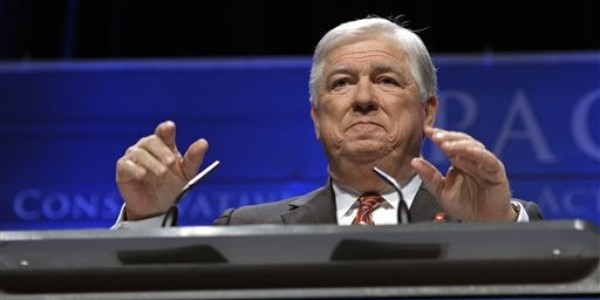 Haley Barbour announced in a statement on Monday that he will not seek the Republican nomination for president in 2012. "I will not be a candidate for president next year," Barbour said in a statement. "This has been a difficult, personal decision, and I am very grateful to my family for their total support of my going forward, had that been what I decided." Barbour's decision comes as a major surprise as the GOP presidential field begins to take shape. Thought to be a serious contender for the nomination -- albeit one with several distinct political liabilities -- Barbour had recently stepped up his travel to early voting states and added several key hires to his political action committee. Barbour noted that he had received encouragement and offers for financial help from "hundreds of people" and said he regretted it if he was disappointing them. "A candidate for president today is embracing a ten-year commitment to an all-consuming effort, to the virtual exclusion of all else," Barbour added. "His (or her) supporters expect and deserve no less than absolute fire in the belly from their candidate. I cannot offer that with certainty, and total certainty is required." Barbour's decision was sure to send ripples through the Republican presidential field and could have an immediate impact on Indiana Gov. Mitch Daniels, as he prepares to make his own decision about whether to run for president. Daniels has expressed ambivalence about mounting a presidential campaign but had previously said that he would be less likely to run if Barbour, his longtime friend, were to enter the race.